When someone is leaving Yekepa to go to Monrovia the news soon spreads because it is a difficult and costly journey especially in the rainy season. The night before I left I planned on four of us driving from Yekepa to Ganta and then three of us from Ganta to Monrovia. I thought we will have plenty of room because the Land Cruiser can comfortably hold five passengers. There was a bit of a surprise on my face when I got into the Land Cruiser and there were nine passengers sardined in together. Three of us were in the front, four in the back seat, and two people were in the back with the luggage. I still can’t figure out how the two were able to travel all the way to Monrovia with luggage bouncing all around them. 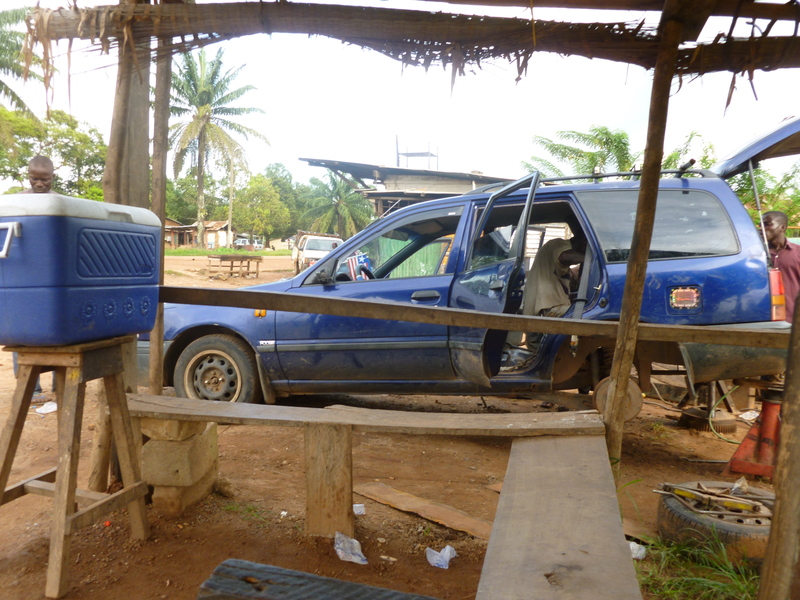 Dr. Miamin, ABCU’s President, laughed and said it looked like a Liberian taxi, which it did. We did drop two of the passengers off in Ganta and only seven of us traveled on to Monrovia. The good news is that because so many of us were stuffed in the vehicle we didn’t bounce as much when we hit potholes. 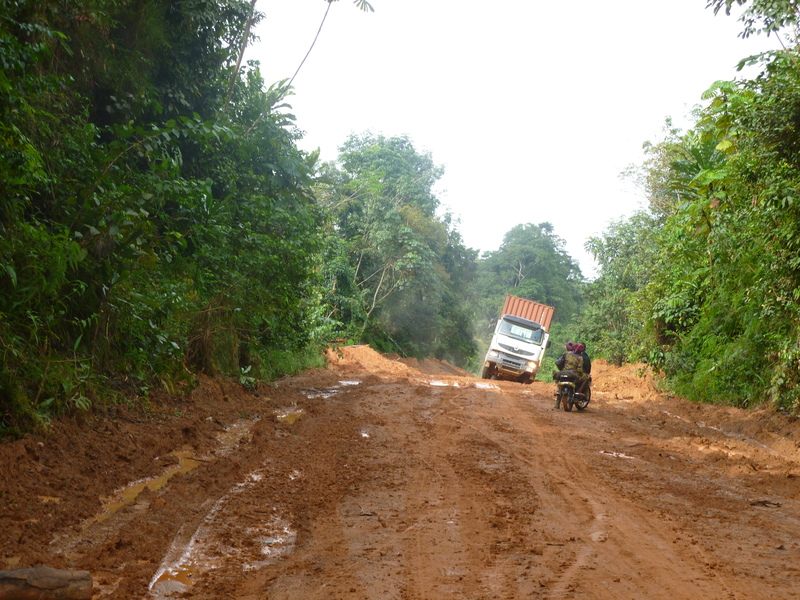 The seven-to-eight hour trip from Yekepa to Monrovia took 13 ½ hours. 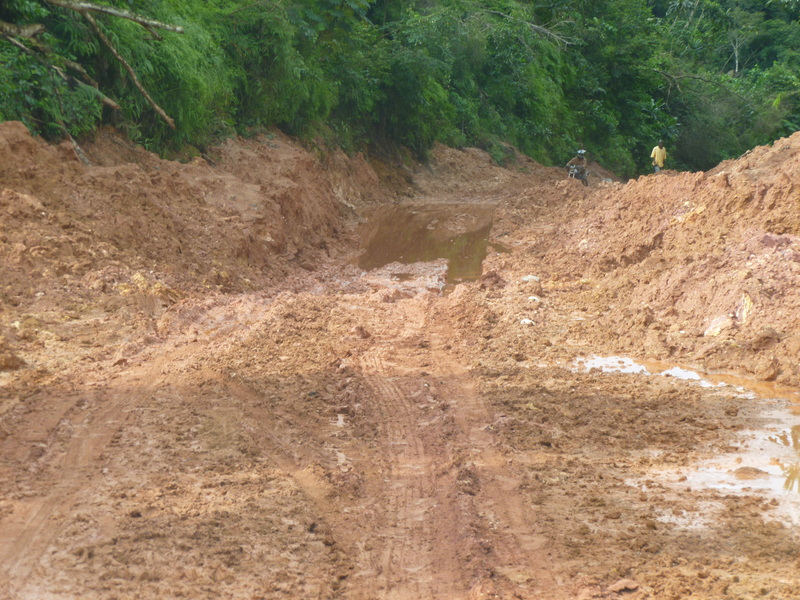 There were parts of the road that were almost impossible to get through and the rest of it was pothole filled. The question was not if you were going to hit a hole, but which one was your best choice. I can tell you that I was glad to be in the Land Cruiser and have our excellent driver, Emmanuel, because I don’t know how we would have made it through otherwise. Even though I have posted a couple of pictures below, you can’t begin to see the depth of the mud and water filled holes. The mud was up to the bottom of the Land Cruiser and so was the water. In one spot, a truck was trying to maneuver up a muddy incline. If it didn’t make it, there was no way that we could get around it. We backed up because we knew that once it started up the hill it would not be able to stop and might slide into us. 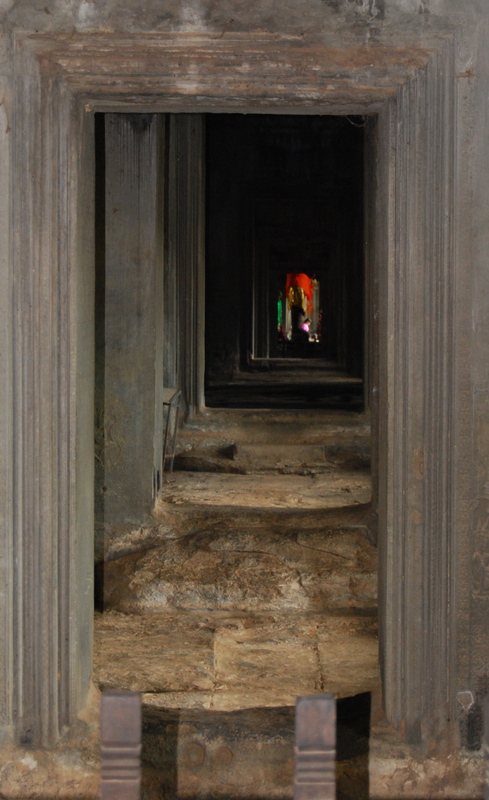 We sat their praying as it swayed tipping to one side. Finally it made it through. The truck made a number of attempts to get up the hill. Sliding in the mud, it began to tip. The next day, another ABCU vehicle tried to make it through but had to turn back. A truck was wedged across the road and it took all day to dig it out. 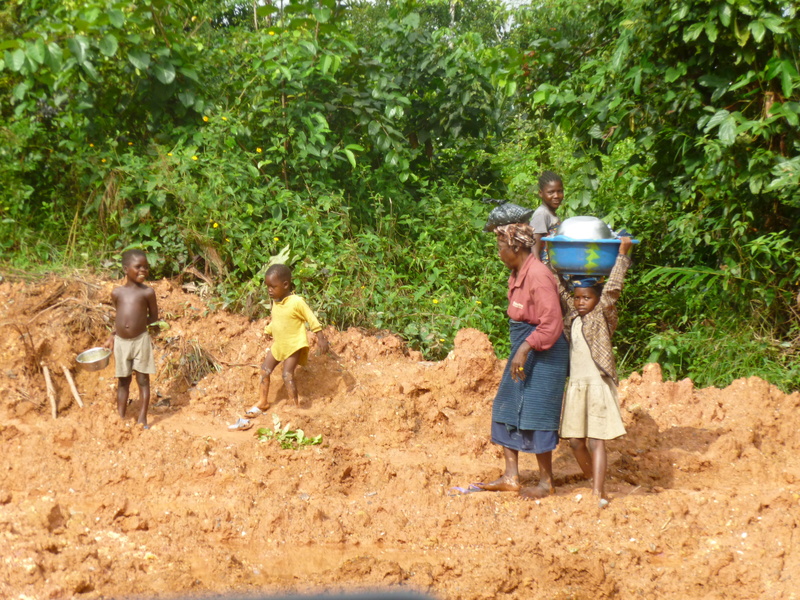 Most Liberian’s means of transportation is walking. Not easy along these roads, but sometimes better than using a vehicle. Ahhh I thought, we made it through the worse spots and now all we have to put up with are the potholes. Little did I know that our breaks were going to go out and that we would be stranded in Gbangan sitting underneath a lean-to. The good news is that we were able to get the shoe brakes to fix the car; the not so good news was that instead of taking a few minutes it took three hours. Some of us are waiting in the lean-to for the Land Cruiser to be fixed. Look closely and you will see a mud puddle to the right and a cooler at the left used as business resources. As I sat there profusely sweating, I thought to myself that I could be home sitting in my comfortable chair watching reality TV; instead I was living it. On one side of the lean-to the mechanics (I think that is who they were) were working on an old beat-up blue vehicle. BANG! BANG! BANG! The echoed rattled through the lean-to along with whirling black diesel smoke as they revved up a machine to work on the car. The blue car next to the lean-to on which the mechanics were working. In front of us a man ran another business. 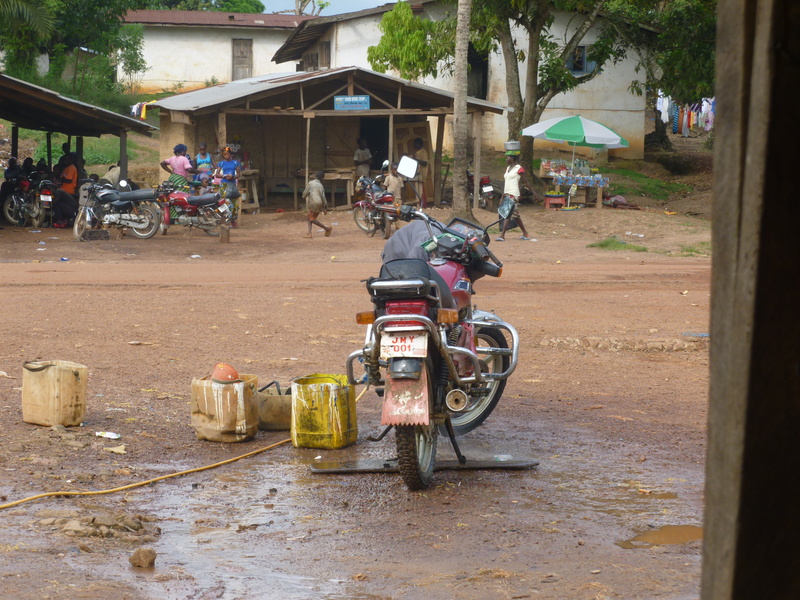 He was selling bags of water plus washing motorbikes that were covered with mud. He evidently advertised that the bikes he serviced would be power washed. After scrubbing the bikes thoroughly with dirty water, he turned on a small generator ran hose that pumped water out of a mud muddle and rinsed off the bike. He and a customer were having an argument about how clean the bike was. Really, how clean could the bike be when you are washing it with dirty water, and why argue if the bike was clean enough because once the customer took the bike on the muddy road, no one would even know it had been washed. If you look closely you can see the power washing hose that siphons water from the mud puddle that was next to the lean-to. In the midst of all of this a Muslim “call to worship” wafted across the air. I happened to turn around and about a foot from where I was seated on the bench a man had spread down a rug and was raising his hand and prostrating himself on the ground reciting his prayer three times to Allah. A small boy noticed none of the confusion as he played with a tire and used two sticks to navigate it down the road. There I set as if all of this was an every day experience, and I guess for those around me it was. 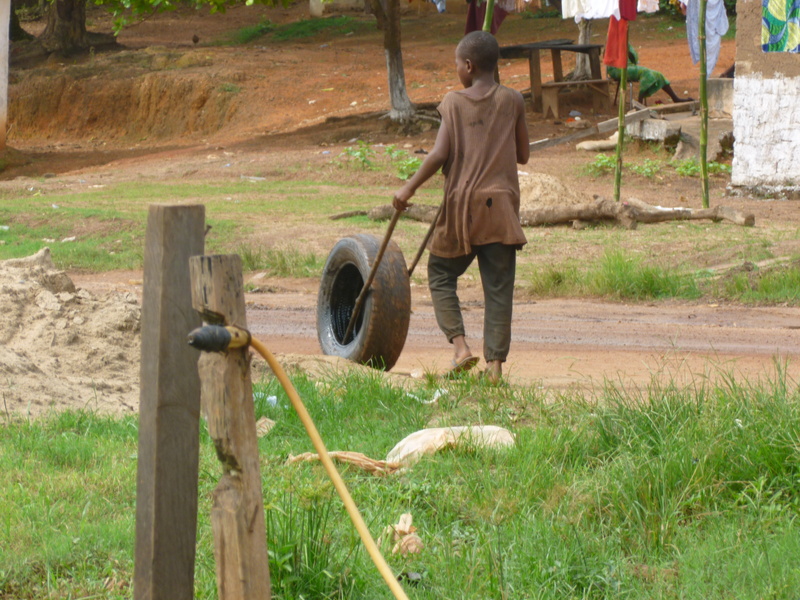 A young boy plays with one of the tires that has come off a car the mechanics worked on. I am a farm girl and one of our sayings is “like a horse heading back to the barn.” The saying best describes what I am like when I get to Monrovia; I count the minutes until I get on that plane and fly home to see my family. On my day of departure, I left early for the airport to get there before the crowd arrived to check-in. As we pulled in I was happy because I was one of the first ones there and I didn’t care if I would have to wait outside (it is a small airport and you can only go inside at a designated time). As we pulled up, we were told that the flight had been canceled and I needed to reschedule for the next day. Even though I was very disappointed I tried to have a good attitude about it. The next day, I arrived at the airport with three other women from Samaritan’s Purse (SP). All of our tickets were from Monrovia to Accra to New York. As we were waiting in the lounge we noticed that our tickets had the same departure time from Accra to NY, but had different flight numbers. I then heard a gentleman say that he had received an e-mail that those who had my flight number would have a seven hour layover in Accra. I asked several agents if this was the case and was assured over and over that we were all leaving Accra, Ghana at the same time. Then one agent said that our flight might leave one hour later, which made sense. Finally one young Delta agent found me and told me that indeed we would have a seven-hour layover, even though it was not indicated on our ticket. I then explained everything to her. She went to get clarification from the head steward. The steward said we would get an explanation before we got off the plane. As I walked off the plane I ask a flight attendant what we were suppose to do. She said an agent would be waiting for us at the door when we entered the airport. No Delta agent was waiting. An SP lady and I were two of the first off the plane and were wandering around the airport asking where we should go. Thank goodness there were English-speaking people (Ghana is Francophone). They directed us to transit. As we went through transit we were once again patted down, our belonging searched, and then were sent to Gate 4. Once again I explained what happened and asked to speak to a supervisor. She curtly responded for us to have a seat and indicated when convenient that she would get a supervisor. By now I knew that would not happen so I didn’t listen to hear and went back to talk to the security lady that sent us through. She told me that she would call a Delta agent. After about 10-15 minutes of going in circles with the agent, he said that Delta would get us hotel rooms for the night. All of us would need to give him our passports and he would then get transit visas for us. We looked at him like you have got to be kidding! 1) We did not trust him to take our passports. Delta had been so incompetent so far that we thought we might never see him or our passports again. 2) It was now past 11 pm and we had to be back to the airport by 3 am to catch a 5 am flight. By the time he processed our visas, we would have no time to sleep at the hotel (little did we know that we would have more time than we thought). All but three of us requested to stay in the Sky Priority lounge because the airport basically closed down overnight. He finally said yes. I asked for food vouchers but he said the lounge had food. It did but there wasn’t much. At 3:30 am the next morning our group walked to Gate 4 to get ready to finally load the plane to NY. By 4:00 am no Delta Agent had yet showed-up to start taking us through security and load the plane. To make a long story short, I asked a young woman working at the information desk three different times to please call a Delta agent to come explain to us why we were not flying out at 5:00 am. She was very nice and accommodating and was just as frustrated as we were. She called three times and the last time she handed the phone to me to talk to security to try to see if they could get a Delta agent to talk to us. No surprise, no Delta agent ever showed up to explain what was happening. Finally around 6:15 am someone showed up at Gate 4 and we took off around 7:00 am to NY. By this time most of us had been awake for at least 24 hours and had a minimum of another 12 hours in front of us. All of us would miss our NY connections and some missed important occasions such as a wedding. I thought to myself, if this were a movie script no one would believe the incompetence and complacency of the Delta agents that we encountered in Africa. So, it was quite the trip home. Even as frustrating as it has been, I still would never give up the time I have spent in Liberia and the adventures I have experienced. I also am reminded that things could always be worse and the world can be a challenging place no matter where you live. I am so thankful that I am not flying into NY this weekend. Because of all of the flight cancelations, I can’t imagine how hard it will be to make it from Monrovia to NY. I have a feeling many passengers will be stranded for days in Monrovia and Accra. 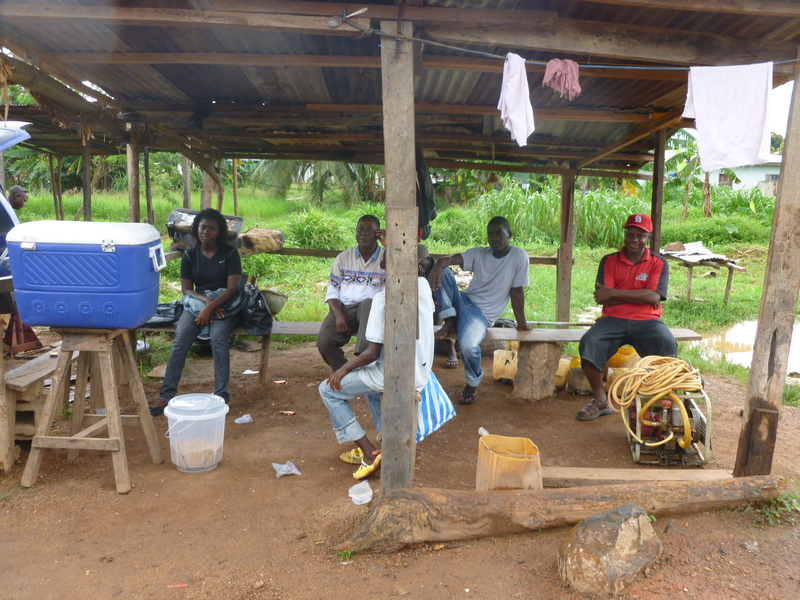 While I was in Liberia the running of the generator and having electrical power was an issue. I held my breath every time the generator quit, hoping it would restart. As I write this blog, the winds are high in Michigan due to Hurricane Sandy and many have lost power around us. We loss power for a couple of hours and I have to admit it was hard, I was so over not having electricity. However, I know the loss of power for a couple of hours is a a minor inconvenience when you think about all of the problems the people on the East Coast are experiencing. Once again I am reminded that when you live in this fallen world concerns for safety can happen anywhere. I happened to live in the area of Michigan where the interstate shooter has struck at least 24 times in the last two weeks and still has not been caught. 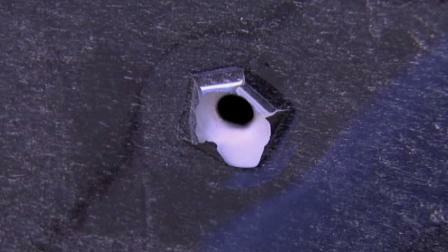 It can be a little scary driving on an interstate wondering if someone might shoot at you. Yes at times it may feel like I am living a version of “reality TV.” However, my true reality and existence is found in God, and He is the one in control no matter where I may be or what may happen. Today’s Think Through: No think through today, but you are welcome to post a comment or a question. Glad you are home, safe and sound Vicki! It seems amazing you made it! Maybe give Delta a call from home to let them know that their customer service needs improvement. As a Canadian, my heart and prayers are focussed on the loss and physical/emoltional challenges for those in and around NYC and NJ. There are so many tragic stories and there is so much devastation. I traveled to Liberia three times this year and each time I had an issue with Delta for one reason or another. This was the “straw that broke the camel’s back,” so I sent a certified letter explaining all three instances to the CEO. I just received an e-mail that they would be contacting me. Yes, it is terrible what the people on the East Coast are going through. We appreciate your prayers. They responded via e-mail and gave me more miles. I e-mailed customer care back and told them miles did me no good b/c I could not use them internationally. I asked for a certificate to upgrade to business class the next time I fly since I am silver medallion and always pay more for economy comfort. They wouldn’t do it but gave me $150 voucher. Actually, it was kind of insulting for as much as I fly with them. I have not had good experiences the last three times I have flew Delta and I can’t tell you how many people have experienced the same thing. I am giving them one more try and then I may quit flying with them.